Over the past several years, the City of Tampa has worked to narrow the Hillsborough River Federal Channel on the south side of Kennedy Boulevard Bridge to the mouth of the Hillsborough River. The River Board examined and endorsed this effort. Most of the channel in the river is 100 feet wide; however, South of the Kennedy Boulevard Bridge, the channel widened to 200 feet for about .4 of a mile until it terminated in the turning basin just south of the Platt Street Bridge. This was probably due to commercial shipping activity in this area in the early years of the City. This area has changed much since then, and commercial shipping activity no longer takes place in this area. The language to narrow the channel from 200 feet to 100 feet was attached to the Water Resources Reform and Development Act which was signed by President Obama on June 10. The channel is now officially 100 feet in this area. 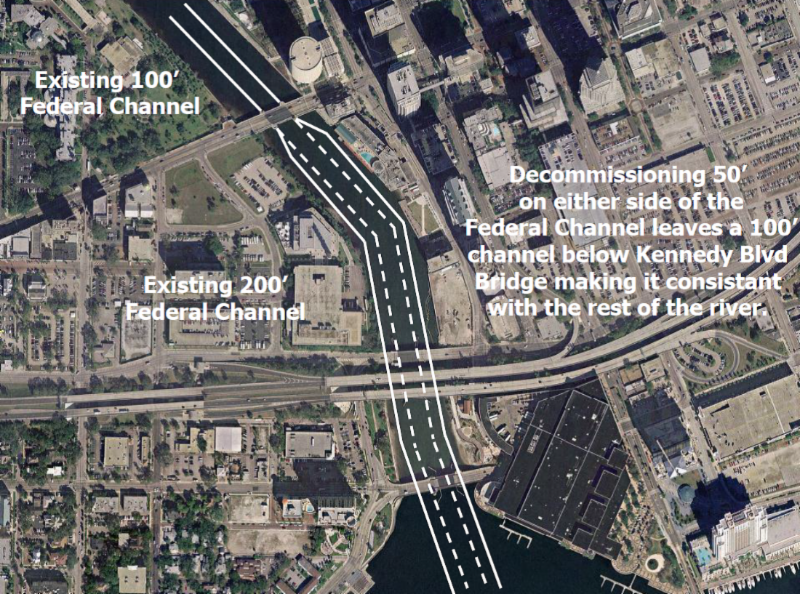 The actual width of the River will remain unchanged; however, this change in the Federal Channel Designation will reduce restrictions on amenities along the shore of the river. The change brings this small section of the river in line with the rest of the waterway and provides the opportunity for docks and water taxi stops. It is hoped that this change will aid in efforts to continue making downtown and the river a vibrant and engaging area for the public to enjoy.